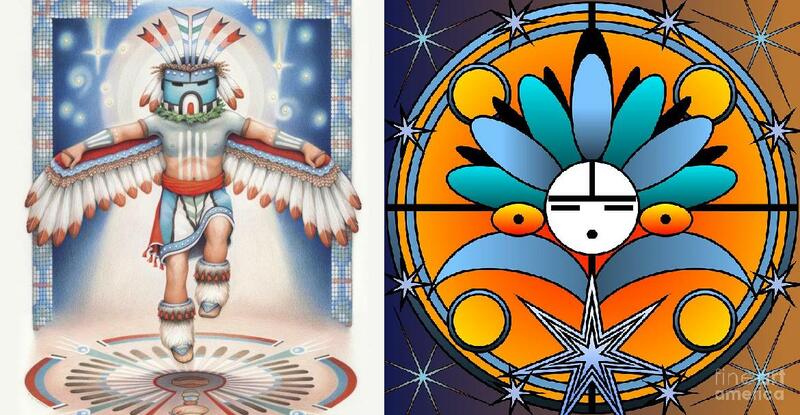 In Hopi mythology, the Blue Star Kachina or Saquasohuh, is a kachina or spirit, that will signify the coming of the beginning of the new world by appearing in the form of a blue star. 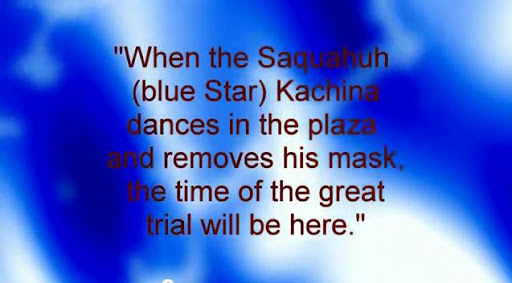 The Blue Star Kachina is said to be the ninth and final sign before the “Day of Purification”, described as a catastrophe or a “world engulfing cataclysm” that will lead to the purification of planet Earth. This is the First Sign: We are told of the coming of the white-skinned men, like Pahana, but not living like Pahana, men who took the land that was not theirs. And men who struck their enemies with thunder. This is the Third Sign: A strange beast like a buffalo but with great long horns, will overrun the land in large numbers. These White Feather saw with his eyes. Some[who?] believe that these eight signs foreshadowing the end of the world have largely been fulfilled and are references to past events. The First Sign is said to be a reference to the arrival of Europeans in North America, while the Second is said to be a reference to the wagon and the exploration of North America by white men. Signs Three, Four and Five are said to signify the arrival of cattle, the construction of the railroad and the proliferation of telephone lines, respectively. The ninth and final sign of destruction is described by White Feather as, “You will hear of a dwelling-place in the heavens, above the earth, that shall fall with a great crash. It will appear as a blue star. Very soon after this, the ceremonies of my people will cease.”. This idea of the Blue Star Kachina marking the end of all Hopi rituals is reflected in Waters’ book, Book of the Hopi, in which he states, “The end of all Hopi ceremonialism will come when a kachina removes his mask during a dance in the plaza before uninitiated children.” This absence of Hopi ceremonialism will coincide with the destruction of the Fourth World. Waters suggested that World War III will begin and the United States will be ripped apart by war, leaving only the Hopis and their homeland intact. The war of the end of the world is described[by whom?] as “a spiritual conflict with material matters “. According to Hopi prophecy (as reported by Waters), shortly after the Blue Star Kachina is visible to all and the Day of Purification is realized, the True White Brother will come to earth in search of Hopi “who steadfastly adhere to their ancient teachings.” It is said that if the True White Brother is successful in finding those who still follow the true Hopi way of life, the world will be created anew and all the faithful will be saved from destruction. However, the Hopi mythology also details an alternate version of the prophecy, one in which the True White Brother fails in his mission and is unable to find uncorrupted men and women. Then it is said that the earth will be completely destroyed and none will be spared. For those of you that know me and are familiar with what I do I am just going to make the connections for you. I don’t really have a lot to say on this particular blog, you either see the connections or you don’t. A kachina (/kəˈtʃiːnə/; also katchina, katcina, or katsina; Hopi: katsina /kətˈsiːnə/, plural katsinim /kətˈsiːnɨm/) is a spirit being in western Pueblo cosmology and religious practices. Kachinas are spirits or personifications of things in the real world. A kachina can represent anything in the natural world or cosmos, from a revered ancestor to an element, a location, a quality, a natural phenomenon, or a concept. There are more than 400 different kachinas in Hopi and Pueblo culture. Notice the need for PATRILINEAL descent in a JEWISH culture which is matrilineal. Kohen or Cohen (or Kohain; Hebrew: כֹּהֵן, “priest”, pl. 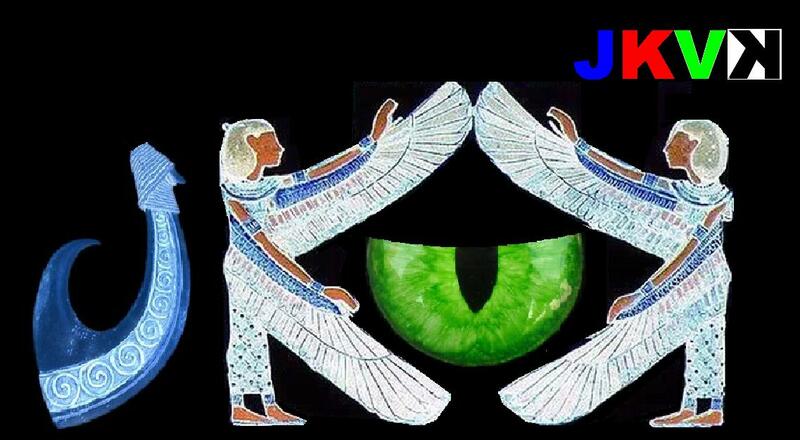 כֹּהֲנִים Kohanim) is the Hebrew word for priest. Jewish Kohanim are traditionally believed and halachically required to be of direct patrilineal descent from the Biblical Aaron. During the existence of the Temple in Jerusalem, Kohanim performed the daily and holiday (Yom Tov) duties of sacrificial offerings. Today kohanim retain a lesser though distinct status within Judaism, and are bound by additional restrictions according toOrthodox Judaism. The noun kohen is used in the Torah to refer to priests, both Jewish and non-Jewish, such as the Jewish nation as a whole, as well as the priests (Hebrew kohanim) of Baal (2Kings 10:19). The Hebrew noun kohen is most often translated as “priest”, whether Jewish or pagan, such as the priests of Baal or Dagon, though Christian priests are referred to in Hebrew by the term komer (Hebrew כומר). 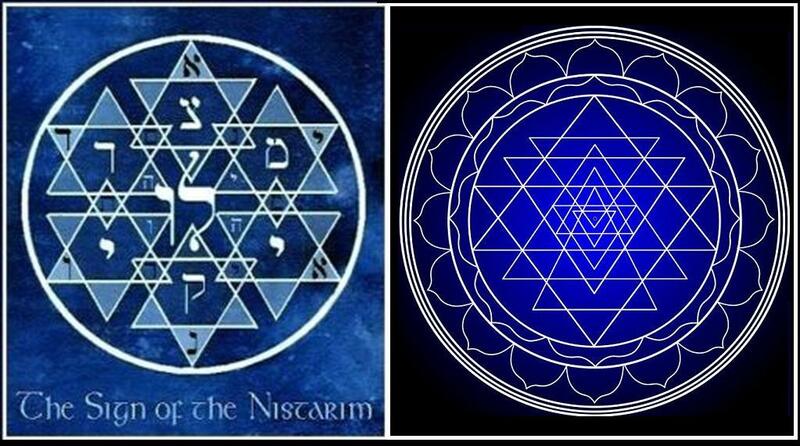 The word derives from a Semitic root common, at minimum, to the Central Semitic languages; the cognate Arabic word كاهن kāhin means “soothsayer, augur, or priest“. Translations in the paraphrase of the Aramaic Targumic interpretations include “friend” in Targum Yonathan to 2 Kings 10:11, “master” in Targum to Amos 7:10, and “minister” inMechilta to Parshah Jethro, Exodus 18:1–20:23 1:1. As a starkly different translation the title “worker”, Rashi on Exodus 29:30 and “servant” Targum to Jeremiah 48:7, have been offered as a translation as well. Some[who?] have attempted to resolve this translation contradiction by suggesting that although the priest does enjoy specific privileges, a primary component of priesthood in Judaism is servitude. A kōan (公案? )/ˈkoʊ.ɑːn/; Chinese: 公案; pinyin: gōng’àn; Korean: 공안 (kong’an); Vietnamese: công án) is a story, dialogue, question, or statement, which is used in Zen-practice to provoke the “great doubt”, and test a student’s progress in Zen practice. According to the Yuan Dynasty Zen master Zhongfeng Mingben (中峰明本 1263–1323), gōng’àn originated as an abbreviation of gōngfǔ zhī àndú (公府之案牘, Japanese kōfu no antoku—literally the andu “official correspondence; documents; files” of a gongfu “government post”), which referred to a “public record” or the “case records of a public law court” inTang-dynasty China. [note 1] Kōan/gong’an thus serves as a metaphor for principles of reality beyond the private opinion of one person, and a teacher may test the student’s ability to recognize and understand that principle. …Its literal meaning is the ‘table’ or ‘bench’ an of a ‘magistrate’ or ‘judge’ kung. The continuous pondering of the break-through koan (shokan) or Hua Tou, “word head”, leads to kensho, an initial insight into “seeing the (Buddha-)nature. The monk himself in his seeking is the koan. Realization of this is the insight; the response to the koan […] Subject and object – this is two hands clapping. When the monk realizes that the koan is not merely an object of consciousness but is also he himself as the activity of seeking an answer to the koan, then subject and object are no longer separate and distinct […] This is one hand clapping. The koans do not represent the private opinion of a single man, but rather the hundreds and thousands of bodhisattvas of the three realms and ten directions. This principle accords with the spiritual source, tallies with the mysterious meaning, destroys birth-and-death, and transcends the passions. It cannot be understood by logic it cannot be transmitted in words; it cannot be explained in writing; it cannot be measured by reason. It is like the poisoned drum that kills all who hear it, or like a great fire that consumes all who come near it. What is called “the special transmission of the Vulture Peak” was the transmission of this; what is called the “direct pointing of Bodhidharma at Shao-lin-ssu” is this. This post is turning out a little longer than I wanted but I want to include all relevant information and exclude all irrelevant information as much as possible so that you can see from my perspective and see what I am thinking. Helena Petrovna Blavatsky wrote that there were two types of meditation masters, the Mammo Kohans (evil meditation masters) and the Dhyan Kohans (good meditation masters). See, over a decade ago I started noticing similar consonance patterns in different languages all over the world. These words all had similar definitions. I realized that these words came from the time of Atlantis when there was only one religion and science and the two things were one. 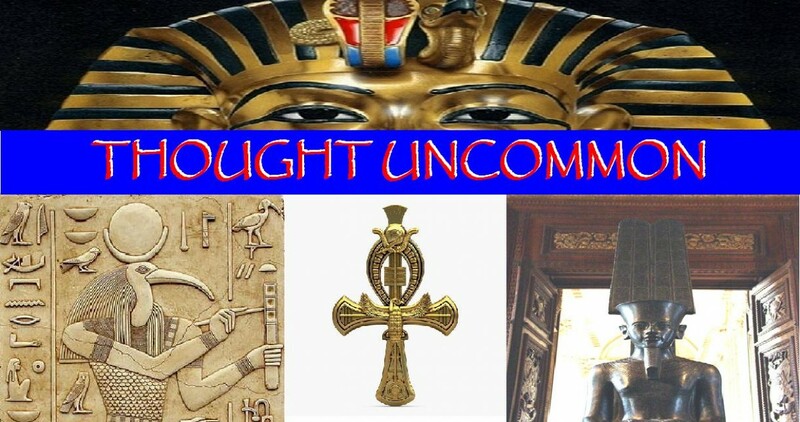 Groups of people and civilizations either appreciated the knowledge and kept it and protected it and remembered it and passed it on, or they forgot it. When I read a spiritual text, something whispers into my ear the true understanding of the material. it points out to me “this is important, this is inspired, this is incorrect, this is a misunderstanding.” It happens in real time, as I am reading it. Seeing that the tide was turning against religious folk, I had to get online with a quickness and kick some light. Let me see, am I forgetting anything? Zen is a school of Mahayana Buddhism[note 1] that developed in China during the 6th century as Chán. From China, Zen spread south to Vietnam, northeast to Korea and East to Japan. Chán (simplified Chinese: 禅; traditional Chinese: 禪, abbr. of chánnà (禪那), from Sanskrit dhyāna, meaning “meditation” or “meditative state”) is a school of Mahāyāna Buddhism developed in China from the 6th century CE onwards, becoming dominant during the Tang and Song dynasties. After the Song, Chán more or less fused with the Pure Land school. From China, Chán spread south to Vietnam and east to Korea (where it is known as Seon) and, in the 13th century, to Japan, where it became known as Zen. The Chán/Zen tradition became the best-known instance of Buddhism in the Western World.